Play the classic arcade game and try to beat the records! Eliminate all underground-dwelling monsters while keeping yourself safe in Dig Dug! Dig Dug is a classic video game that was released back in 1982 for various gaming platforms and arcades including a home version for Nintendo Entertainment System (NES). In this game, your goal is to eliminate all enemy creatures located deep underground by puffing them with air or dropping heavy rocks on top of them. Take control of the cool and capable character as you defeat all enemies in every level and make it out alive. 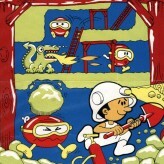 Dig Dug is an online NES game that you can play at Emulator Online. This free Nintendo game is the United States of America region version for the USA. Dig Dug is a single title from the many racing games, arcade games and dig dug games offered for this console. If you enjoyed playing this, then you can find similar games in the nes games category. 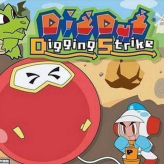 Dig Dug game is from the various retro games on the site, and there are more games like this, including Pokemon - Digimon FireRed, Dig Dug: Digging Strike and Digimon World DS.